It would be impossible to cover all of the University’s resources, facilities, and stories in a single tour. You may want to start with a digital overview, or stop by the Information Center located at 5801 S. Ellis Avenue to find out which tours, or self-guided explorations of attractions, are suited to your interests. The Office of College Admissions invites prospective undergraduate students to visit on weekdays when class is in session for tours and information sessions, meeting at Rosenwald Hall. Individuals or students with families and guardians may register for a tour by selecting an available calendar date and completing the online submission form. Class groups or groups consisting of 20 or more individuals are requested to review the Group Tours directives for further information. Chicago Booth, our graduate school of business, invites prospective full-time MBA students to participate in the informal Daily Campus Visit Program or a full-day Chicago Booth Live event. Campus visit arrangements are also available for prospective students interested in part-time or advanced study. Student-led tours are available on selected days when class is in session, and self-guided tours are available in the Admissions Office. We also invite students to download an audio tour. The Graduate Admissions Offices invites prospective students to register and then visit on weekdays. Visit the Graduate Admissions Visit page for more information. Student guides provide introductions to several campus locations in the UChicago virtual video tour. Library tours are available for prospective graduate students, faculty, and visiting scholars by request. Visit the Library’s tour page for more information. You can stroll about campus at your leisure. 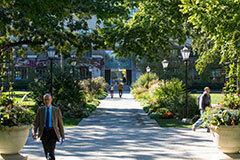 Using the downloadable campus guides, take in all the neighborhood’s sights at your own pace. Feel free to admire the ins-and-outs of the University’s many historic buildings via the UChicago Architecture site. While you’re in the neighborhood, pay a visit to Frank Lloyd Wright’s famous Robie House, considered one of the most important buildings in the history of American architecture. Robie House is located across the street from the Chicago Booth School of Business and just a short block away from the heart of campus. Hyde Park-Chicago Tours offers a variety of Hyde Park neighborhood tours including Haunted Hyde Park tours, a Hyde Park 101 tour, as well as a tour dedicated to the Obamas’ favorite spots. The Chicago Architecture Foundation (CAF) offers occasional docent-led tours of Hyde Park and the UChicago campus. Stroll along the Midway, see buildings ranging from pre-fire frame farm houses and brick Italianates to the new UChicago business school with its tubular steel vaults and glass panels, and learn more about Hyde Park and UChicago history. The Civic Knowledge Project’s You Are Here site is an online tour of Hyde Park and its surrounding neighborhoods. Learn about the history of local politics, housing, architecture, and much more. Arts abound in and around the University. We invite you to visit UChicago Arts to get an overview of the vibrant culture here and access a list of the cultural organizations in the area. UChicago Arts also features a calendar of arts events and attractions. If you already have a UCID, the Arts Pass program offers you many ways to explore. The Oriental Institute offers a variety of docent-guided tours of its collection, as well as a self-guided audio tour. The Smart Museum of Art is free and open to the public. The museum offers a variety of guided tours, including docent-led group tours. Although the Medical Center does not offer tours, there are many resources for patients and visitors. Watch a virtual tour online.